In May, we renamed and rebranded our AWARE collection. This is a special collection the library started in 2009 at the request of the AWARE students, who asked that we create a special shelf for books specific to social and cultural medical issues. Initially we included some books from our existing collection, and SGA/AWARE contributed funds to purchase additional books. It’s not clear how many books were in the original collection, but correspondence from the time refers to it as a “shelf,” which suggests that it wasn’t more than about 30 books. This collection has grown in the ensuing years and now includes nearly 100 books and DVDs. We continue to add to the collection; in fact we recently purchased six new books in honor of Black History Month. Recently Kitwana Pounsel-Lott of StudentsAWARE approached the library asking how we could make the collection more visible and its content more transparent to those not familiar with the AWARE acronym. 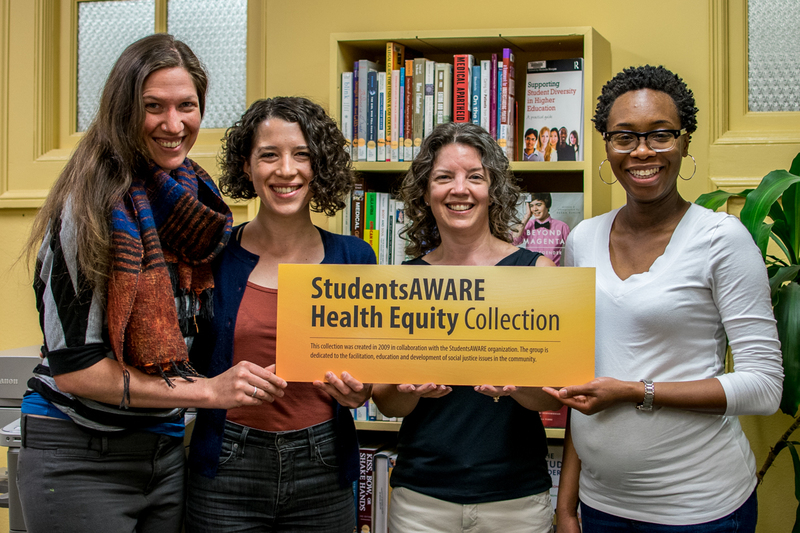 After considering a number of options, we decided to change the name of the collection, or rather elaborate on it, to the StudentsAWARE Health Equity Collection. The new and larger sign further increases the visibility of the collection. We thank Kitwana and the StudentsAWARE group for taking the initiative and working with us to enact this change! The mission of AWARE (Actively Working to Advance Real Equity) is to create a culture of inclusion at NUNM, guide the effective recruitment and retention of diverse faculty, students and staff, and to promote excellence in natural medicine by providing culturally and linguistically appropriate education and health care. The goal of AWARE is to create an environment at NUNM that is genuinely welcoming to all community members, with an emphasis on preparing students to work with the diversity they will encounter in all their professional activities. StudentsAWARE is a student organization dedicated to the facilitation, education, and development of social justice issues, both on campus and in the community. The mission of StudentsAWARE (Actively Working to Advance Real Equity) is to support AWARE in creating a culture of inclusion at NUNM (National University of Natural Medicine). Our goals include promoting culturally and linguistically appropriate health care, improving the curriculum to include a stronger understanding of diversity and provide students with the tools and experiences needed to competently serve diverse populations.